I well remember my own flattered astonishment when some good simple soul told me, after listening to my own Jardin Parfumé, of the various rustic sounds he said he heard therein; the brook, the bees, the birds doing all the things you expect birds, bees and brooks to do in their punishable moments. I would not forebear to ask the good soul if he also heard the rich purée d'epinard plop of the cows emptying their bowels, those least - so admirably least - costive of creatures, whose evacuations, performed with such nonchalance and brio, and full-bowelled ease, are such a shining example to the constipated idiots who live on and by them. 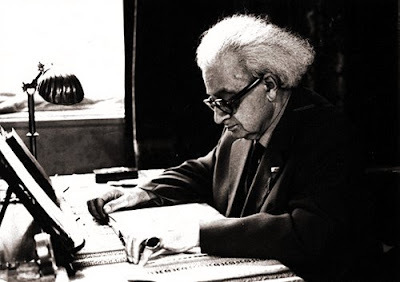 Kaikhosru Sorabji writing in his 1947 book Mi contra fa: The Immoralisings of a Machievellian Musician. Geoffrey Douglas Madge's recording of Sorabji's Opus Clavicembalisticum is available as a download for £13.98 from amazon.co.uk, which is quite a bargain for 5 hours 43 minutes and 23 seconds of music. My John Ogden post is the obvious link. But why be obvious? - so instead I'm suggesting visiting another Jardin Parfumé. And yet, on the score to his symphonic poem "Chaleur", he appends an extensive programme, including - amongst other things - comments on the annual incidence of death from snakebite on the Indian subcontinent. 'Sorabji writes like he composes, in verbose, convoluted sentences'. I love Percy Scholes' work in the Oxford Companion to Music and the Concise Dictionary, as he writes with such personal flair. He tried to pin down the birth date for this prickly character and was told by him he tried to deliberately "mislead" when dealing with "stupid and impudent enquiries from lexocographical persons". This exchange was after Sorabji had publicly complained about wrong dates being given. Scholes concludes the entry with, "It is hoped this frank admission will preclude further public complaints." His descriptions of Sorabji's music in the body of the entry are not sympathetic. J'aime assez les études transcentales de Sorabji, compositeur que j'ai découvert voici peut-être trois ans grâce à une émission de France Musique. J'ai écouté sur le podcast de ce très bon blog "On an overgrown path Daan raconter comment il a rencontré Alvin Curran. "Inner cities", cela reste pour moi la plus grande oeuvre de ce vingt-et-unième siècle, prodigieuse, un absolu.